Acquisio brings Christmas Holiday Cheer to the masses once again this Season with Super Santa Rider, an addictive game of skill and chance where you guide Santa and his supersonic sled through endless jumps and power boosts in a game where you must cover maximum distance without running over too many Acquisio employees. 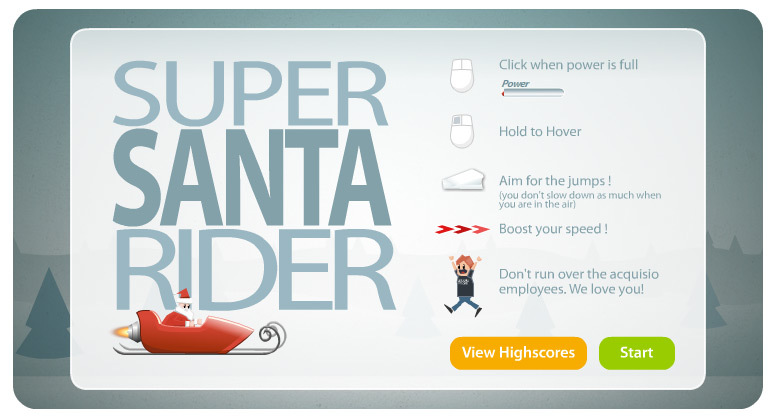 Be sure to submit your high score – you could earn the title of Super Santa Rider Champion 2008! PS – we originally let the developers do whatever they wanted. Bad mistake. To see the uncensored version of super Santa Rider. Be aware that this may be a little disturbing.